How does one become interested in a career of armor making? The Oakeshott Institute, which established the first arms and armor museum in the five-state region, promotes interest in ancient arms and armor through a hands-on educational approach. It sponsors several educational events including “Knight for a Day” summer camps for children ages 7 to 14. 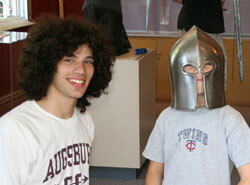 As part of his summer internship, Davis teaches campers about armor and medieval history, leads them in making paper helmets, cardboard shields, and mail armor, and engages them in a reenactment of the Battle of Hastings using their new armor and Nerf® balls. Davis plans to go on to graduate school in medieval studies and hopes to build a career in making armor. For more information about The Oakeshott Institute, visit www.oakeshott.org, and about Augsburg’s medieval studies program, visit www.augsburg.edu/medievalstudies/.